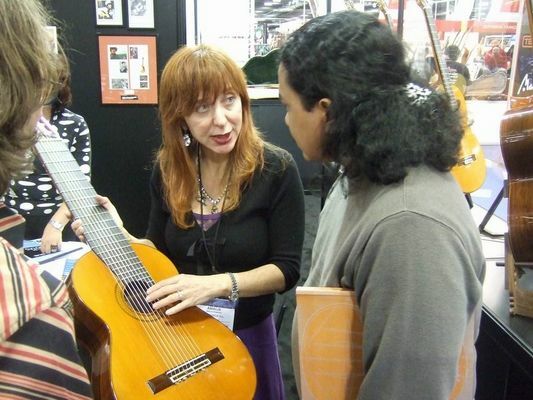 I went to the Winter NAMM Show in Anaheim again this year, and when I met up with Pepe Vergara last Friday, we checked out some booths. He even stayed around to watch me play my 10-string in a demo for one of the booths there. 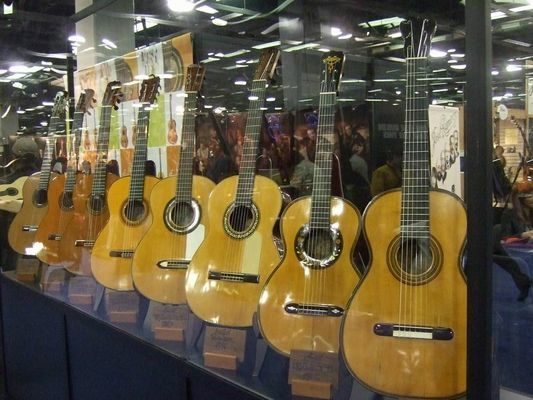 I was pleasantly surprised to find that Guitarras Ramirez has a booth this year. Apparently, 2007 is their 125th Anniversary so they came over to make their presence felt. They brought some guitars from their private collection. 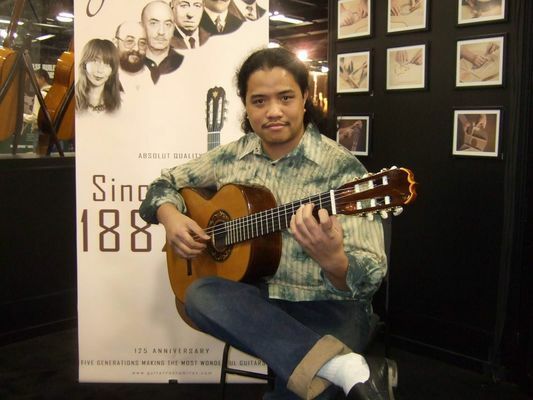 In no particular order (I forgot which was which): Francisco Gonzalez (late 1800s), Manuel Ramirez, Jose Ramirez I (early 1900s), Amalia Ramirez flamenco in cedar/cypress (1970s), 2005 Ramirez 1A. 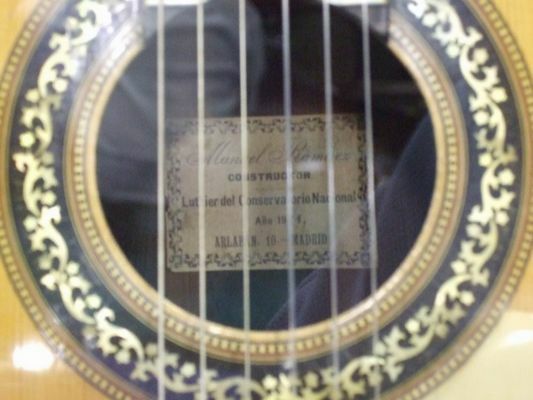 Rosette and Label of the Manuel Ramirez guitar. The Ramirez Booth had been busy the whole day with endless people streaming in and out of the area. 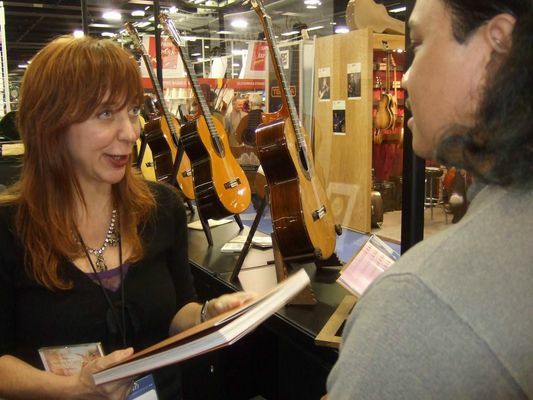 Since the day was winding down and I wouldn't have my 10 string with me the next day, I hung around the Ramirez booth and waited for my chance to meet Amalia Ramirez. 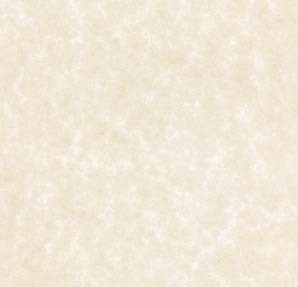 Their Italian distributor, Luigi, finally noticed me and after a small chat, then introduced me to Amalia. 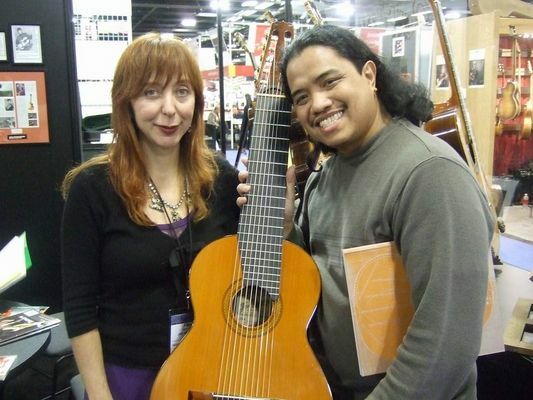 I met with Amalia and showed her my 1973 Ramirez 10-String. She was happy to see it in such good shape! Being the current representative of the Ramirez guitar-building family, I thanked her for building this wonderful instrument. I gave a copy of my new CD. In an incredible act of generosity, she gave me a copy of her new book, which contains photos and history of Ramirez guitars! Luigi told me that she didn't give these to just anyone, so I was very honored!